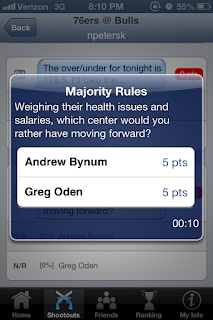 SnapCall: Moving Forward: Greg Oden or Andrew Bynum? Moving Forward: Greg Oden or Andrew Bynum? Last summer, the Philadelphia 76ers traded franchise player Andre Iguodala to acquire Andrew Bynum as part of a four-team blockbuster deal. In last year's strike-shortened season, Bynum posted career-highs of 18.7 points and 11.8 rebounds per game. Although Dwight Howard heading to the Los Angeles Lakers drew most of the headlines, many believed the Sixers might threaten the Miami Heat in the East. Eight months later, Andrew Bynum has yet to suit up for a game amidst rumors that he has a degenerative knee condition. The 76ers are a miserable 22-33 and 5 ½ games out of a playoff spot. The 7-footer, who appears more concerned with his hairdo than post-game, is likely seeking a long-term deal worth tens of millions this offseason. Does he deserve the hefty contract? Doubtful. But, considering how teams covet franchise centers, there are likely a few owners willing to pony up a Brinks truck for Bynum. When push comes to shove, Bynum will likely cash-in, despite his lost season and questionable fashion sense. Greg Oden, another center that was once considered a franchise player, is also looking to make a comeback. In 2007, when Oden was chosen first overall ahead of Kevin Durant in the draft, the league expected immediate results. Instead, injuries derailed his career. He has had a total of five knee surgeries in the last three years and he hasn't even appeared in a game since the 2009-10 season. However, the Ohio State alum is looking to return to the court next season. Although his medical history spans the length of a Russian novel, the Celtics, Heat and Cavaliers are reportedly interested in Oden's services. Considering their potential salaries relative to their production, tonight's SnapCall was fired off to see how the audience felt about the Oden vs. Bynum argument. Remember, Majority Rules is a question type in SnapCall that asks the audience to guess the majority opinion to get the points. So, who would you rather have playing for your team over the next few seasons? Greg Oden, with his minimal non-guaranteed contract, or Andrew Bynum, with his potentially massive long-term deal and injury history? Download SnapCall Sports from the App Store and get in the game to have your say.